My side of the family live in south east England. My partner, Tilo’s family live in Germany. We met in Germany, lived there for eight years, moved to England for four, then back to Germany for one year, then finally settled on England. This has meant that we have often travelled between the two countries several times a year, often by plane. Tired of travelling and unable to justify long journeys for short trips, recently we have aimed to travel less frequently between the two countries and do longer journeys by train. The regional base map shows the main connection points for more frequent travel. We travel to my parents and brother a few times a month. To school every day. Over to Brighton for Brighton Permaculture courses more and more frequently! 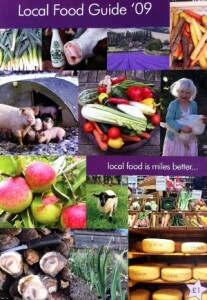 However in terms of our food needs, our prime directive is local, organic food. an amazing resource published by Transition Forest Row is a Local Food Guide mapping farm shops, fruit and vegetable, meat and game, dairy and drink producers as well as transition initiatives and farmers markets. You can view the map online at bigbarn.